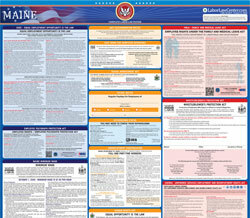 The Minimum Wage Poster is a minimum wage law poster by the Maine Department Of Labor. This is a mandatory posting for all employers in Maine, and businesses who fail to comply may be subject to fines or sanctions. This poster must be posted in a conspicuous place where all employees will see it. This poster describes the Minimum Wage Law for tipped (Service employees) and untipped employees as well as the law with regard to overtime and exemptions to the Minimum Wage Law and Overtime Law. This poster also lists information on equal pay in the workplace for both sexes and how to get more information on the Minimum Wage Law. It appears you don't have a PDF plugin for this browser. Please see the link below to download maine-minimumwage.pdf. workers can easily see it. employers who do not comply. requirements under the Fair Labor Standards Act (FLSA). depending on the discrepancies in the laws. hours worked and wages paid to all employees. 207-623-7900 or may visit the department’s webpage. minimum wage in Maine is $11 per hour.